Israeli security forces have uncovered a significant Iranian attempt to infiltrate the West Bank and use it as a base for launching terrorist attacks and hostile intelligence gathering operations against Israel. The radical Shi'ite axis, led by Iran, has long held the ambition of flooding the West Bank with weapons, terrorist cells, and espionage agents, turning it into an active Iranian terror base. In recent years, most of those efforts have seen Hizballah, Iran's chief proxy in the region, attempt to create a footprint in the West Bank. Israel has foiled multiple Hizballah attempts to set up terrorist cells among Palestinians, and recruit them for bombings, shootings, and espionage. In one high profile case last year, Shin Bet found that Hizballah's Unit 133, responsible for foreign operations, was operating a social media recruitment program in the West Bank and Israel in hopes of setting up terrorist cells for suicide bombings and gun attacks. Yet the latest plot to be broken up by Israel's Shin Bet domestic intelligence agency shows direct involvement of Iranian intelligence agents in orchestrating a Palestinian terrorist cell in Hebron. Until now, most of the known Iranian attempts to promote Palestinian terrorism played out in the Gaza Strip, Reuven Erlich, director of the Meir Amit Intelligence and Terrorism Information Center in Israel, told the Investigative Project on Terrorism. 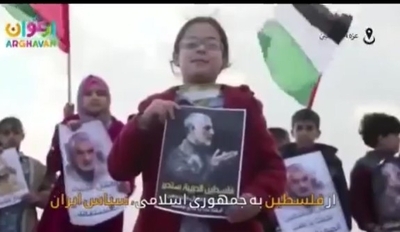 In recent days, the Iranian Republican Guards Corps (IRGC)'s elite overseas unit called the Quds Force released a propaganda video showing Gazan children "thanking" Quds Force Commander Qassem Soleimani for his support. "Until today, the connection to Iran was mostly seen in the Gaza Strip, through Palestinian Islamic Jihad (PIJ), and Hamas," Erlich said. Under Palestinian Authority (PA) President Mahmoud Abbas, relations between the PA, which governs most Palestinians in the West Bank, and Iran, soured, Erlich said. Things were different under Abbas's predecessor, Yasser Arafat. Iran "enjoyed a romance with the PA" during Arafat's time, Erlich said, recalling Iranian weapons smuggling efforts, including the Karine A weapons ship that was packed with arms destined for the PA in 2002 when it was intercepted by Israel. Today, however, the PA sees Iranian and Hizballah activities in the West Bank as a "direct threat," Erlich said. Israel's "abilities to take care of this threat" prevent Iran and its proxies from realizing their vision of building a network of terrorist outposts in the West Bank. "The Iranians find it much easier and simpler to get to Gaza, though they also have problems reaching it, with Egypt in the rear," Erlich said. Despite the Egyptian obstacle, Erlich warned, there has been a "flood of declarations" by Iran, Hizballah, and Palestinian terrorist factions in Gaza indicating a new level of cooperation among them. Iran has, over the past months, transferred $100 million to Hamas and PIJ, due to the fact that they "share the same vision about the State of Israel," Israel Defense Forces (IDF) Chief of Staff, Lt.-Gen. Gadi Eisenkot said in a recent speech. The Shin Bet announced last week that it had uncovered and foiled a West Bank terrorist infrastructure "that was run by an Iranian intelligence operative living in South Africa." "The principal operative that was arrested is Mahmoud Makharmeh, 29, a computer engineering student, who resides in Hebron. He was recruited for Iranian intelligence activity by a relative of his, Bakhar Makharmeh, who is from Hebron, but who has been living in South Africa in recent years," the Shin Bet stated. "Iranian intelligence has been using South Africa as a significant center for locating, recruiting and activating agents against Israel in Judea and Samaria [the West Bank]," it added. Acting on behalf of the Iranian intelligence agents, Bakhar Makharmeh tried to recruit operatives in the West Bank and in Israel for espionage and terrorist missions, according to the investigation. Bakhar took advantage of a 2015 visit by his relative, Mahmoud, to South Africa, and succeeded in recruiting him, the Shin Bet said. Mahmoud then had several meetings with Iranian agents, "several of whom came from Tehran especially to meet him." Following his arrest, the IDF's Judea and Samaria Military Court charged Mahmoud Makharmeh with several severe security crimes. The charge sheet alleges that he worked to recruit suicide bombers and a shooting terrorist cell. It also details his involvement in a training course for the use of explosives and other weapons, and the opening of a computer store in Hebron which was supposed to double as an Iranian intelligence gathering post. 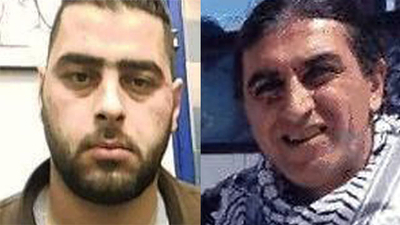 Mahmoud Makharmeh allegedly recruited an Israeli Arab man to take photographs in Israel. He also sent Israeli SIM cards and cash to the Iranians – items that were apparently necessary for the next stage of Iran's operations. The Israeli charge sheet details how Mahmoud Makharmeh recruited two Palestinians in Hebron, both aged 22, who agreed to join the Iranian-run terrorist cell. "Mahmoud received $8,000 from the Iranians to operate the cell," the Shin Bet said. The Iranians instructed him to also recruit residents of Israel, including journalists, because they have access to official sites. The two Palestinians recruited by Makharmeh were charged with conspiring to join an illegal organization. The investigation "underscores Iran's involvement in sponsoring terrorism against Israel, and exposes Iran's efforts in various countries in order to promote hostile activity against Israel," the Shin Bet said. Commenting on the investigation, Israeli Prime Minister Benjamin Netanyahu said, "This is not the first time. They are trying various methods, and in various fields, to attack the State of Israel. I am pleased that the ISA [Shin Bet] and our security services have succeeded in foiling it. I would like to bring it to your attention that Iran is using terrorism against the State of Israel not only with the assistance of terrorist movements such as Hamas, Hizballah and Islamic Jihad but is also attempting to organize terrorist actions inside the State of Israel and against the citizens of Israel."